Not Trying + Negative Self-Talk = Complacency. This equation of a stalled lifestyle often derives from a smug (sorry but true) belief that you’re where you should be. Worse, do you lack motivation to improve? A sense of self-satisfaction or why bother trying mentality is kryptonite to living your best life. Don’t be in so deep that you don’t know how to stop being complacent. We live in a world filled with just too many distractions and way too much stress. I wonder if sometimes people get desensitized to all of the chaos going on today around the world and in our personal lives. It’s rather tempting to avoid confronting the feelings that accompany the stress that comes from things like…living! You know, staying healthy, maintaining relationships, raising small people, climbing the corporate ladder, managing finances, having finances to manage, keeping up with the Smiths (never mind the Kardashians! ), etc. Hit pause! Shut it off! Lay me down on the comfort zone couch so I can just start over again tomorrow! And don’t let me ruffle any feathers in the process. Are you a people pleaser because you don’t want to make anyone angry? Do you settle for less because it is easier than disrupting a routine? Do you accept circumstances for “what they are” to keep people happy? Are you not pursuing a goal because of the fear of failure or not knowing where to begin? Sometimes the negative self talk in my head can get so loud my fear of failure, embarrassment or not being liked wins over the desire to even try to make a change. Settling in to a routine and being comfortable can feel very safe and peaceful. Who doesn’t want peaceful? But don’t fool yourself, staying in you comfort zone will not bring you the sense of fulfillment you truly need to live your best life. So many of us avoid risk or difficult circumstances because it’s uncomfortable. 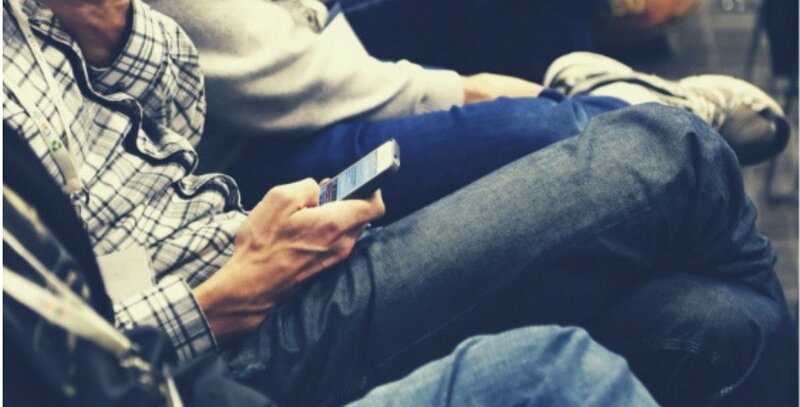 We procrastinate, find other things to do, mindlessly scroll on our devices. All of this ultimately causes discontentment – and a lot more frustration. Think of not wanting to deal with a task that is in reality unavoidable. For example, what if you don’t want to confront a difficult client, have a medical procedure, or even pay your taxes. (Well who really wants to pay taxes?) Nevertheless we often make judgements to justify the procrastination as a result of relentless inner dialogue and made up stories anticipating all of the possible outcomes. and result in my getting fired. Aaaaand when we make assumptions…. Paying these taxes will drain all my hard-earned money; this is so unfair! if something goes horribly wrong? …the result is that we will fall short because we don’t follow through. The problem here is that complacency kills any hope for progress. Even the mindset that your life is just fine as it is is a form of negative self talk. It is stagnancy and it is dangerous. Know that your time is valuable and you are worth it. Use resources like following motivational influencers (such as Brene Brown, Tony Robbins, …) to hone in our your self-worth and self-love. 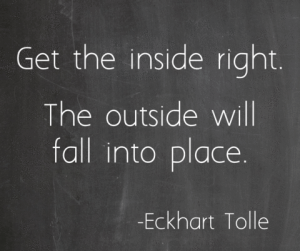 A positive, resilient self esteem is absolutely critical to putting an end to complacency. Set goals for yourself that resonate with who you are as a person. Studies show that the more goal-oriented a person is the less stagnant. Sometimes life is so hectic that it’s hard to put your needs ahead of others – this is not an option. Respect your commitments but know that if you do not fill your own well, you will not have any water left to stay nourished. Translation: Living the best version of yourself will benefit everyone else as well. Ask yourself, “Am I doing my best?” Sure you can lie to yourself but you certainly cannot fool yourself. 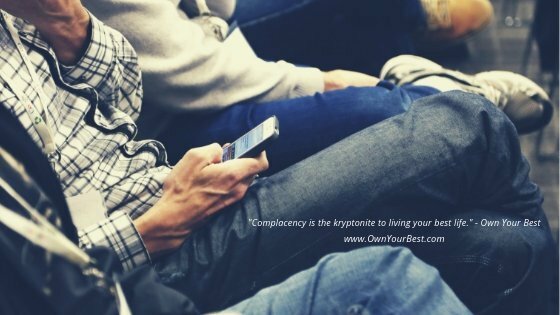 Take conscious ownership of overcoming complacency so you won’t be able to fake it. Only you must own it – yes, Own Your Best! If you like routine, use that love you have for consistency to incorporate in to managing your life and your goals. Utilize resources and strategies to do what it takes to stay committed to your goal. For example, leave pictures around of your goal (make a vision board), have a friend or mentor to keep you accountable if that’s what you need and stay busy. Take care of your body as much as your mind with a healthy diet and physical exercise. 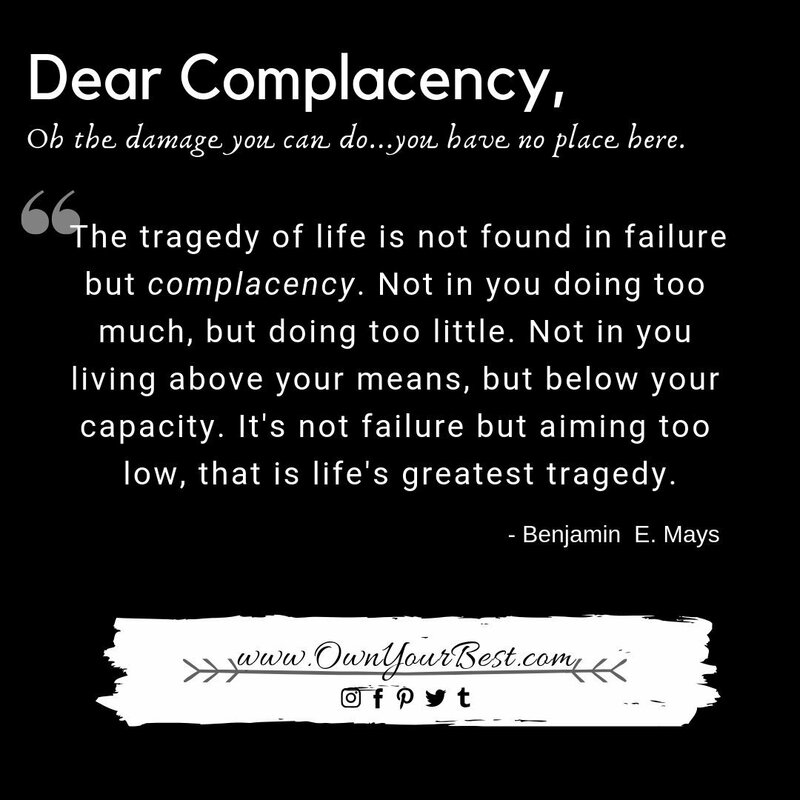 Sometimes we don’t know where to start, what to do first and even what not to do that we become paralyzed with complacency. Look for helpful guides and checklists to not just address your goal but to declutter your life in general. This is one of my favorite resources from a practical standpoint! 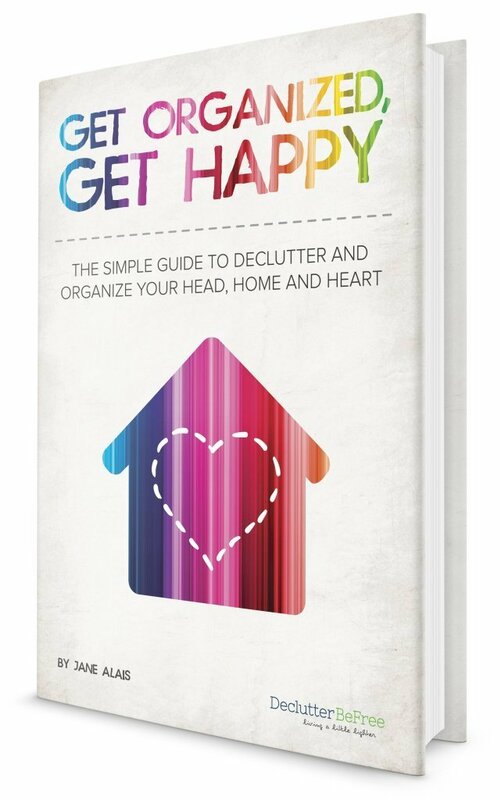 It’s an effective All-In-One-Guide called Get Organized Get Happy: The Simple Guide to Declutter and Organize your Head, Home and Heart. Click Here for More Information! I promise to go into more detail in a separate post on how this ebook, Get Happy Get Organized by Jane Alais, among other tips and tricks, has made such a difference for me in managing my life. Reminding yourself of your mortality may be a little depressing but it will also light a fire under you if you truly get it. A healthy sense of urgency is an effective antidote to complacency – so use it. Look for ways to see the world outside of yourself by volunteering for meaningful projects or organizations that are close to your heart. Helping others is one of the best ways to bring out the best version of yourself – it’s a win, win. If you think you need to stop being complacent there’s a good chance you’re not truly enjoying life. That’s a powerful message you need to hear. Feeling bad about your life doesn’t mean you have emotional problems or that you’re psychologically damaged in some way. Your feedback mechanism is doing its job just fine. You’re supposed to feel bad when your life is out of whack. You just need to interpret the message properly and then take action to correct the situation. The most critical way to understand how to stop being complacent is to stop lying to yourself. Stop telling yourself that you don’t have the power to make meaningful changes. It’s quite likely that the excuses, negative self-talk and imagined outcomes you create are the influences – remember, kryptonite. So believe it or not you’re probably making the necessary actions a lot more complicated than they need to be. Take the conscious ownership I refer to throughout my articles and put yourself to work! Practice mindfulness and meditation throughout the day and recognize when complacency is afflicting you. It’s rather amazing how many stuck situations can get unstuck with just a few moments of action and a conscious decision to Own Your Best. Abundance, Complacency, How To, Organization, self-help, well-being. Bookmark. 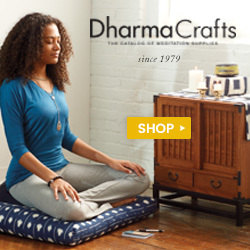 The Gift of Mindfulness – learn how to practice mindfulness throughout the day!